Russian President, Vladimir Putin, is going to visit the Aegean on the yacht of an entrepreneur friend. Although it is difficult to tell Putin’s plans for sure, it seems that after Mount Athos, which he visits every year, the Russian president wants to see the Monastery of Saint John the Theologian located in Patmos. The Greek Orthodox monastery founded in 1088 in Chora on the island of Patmos has been declared a World Heritage site by UNESCO. It is built on a spot venerated by both Catholics and Eastern Orthodox as the cave where St. John of Patmos had visions. In 2012, 40 monks resided there. 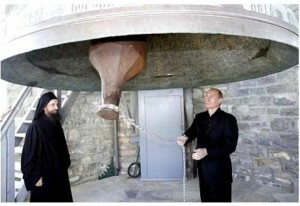 Putin will also visit Mystras. The last Byzantine emperor, Constantine XI Palaiologos, was the despot of Mystras before he ascended the throne. Political commentators in Russia believe that Putin’s new “turn” to religion even on his vacation is part of a communication strategy to show worshipers and traditional Russians that despite his divorce, he remains true to his values. In each case, Greece will be benefited by pilgrimage tourism, especially from the Russian market.